Well, here's the plan for the trip starting on Saturday evening! Our son, Kyle graduates from Northern Illinois University around 2:00 PM and we will hang around for a few photos and will head home and then straight to the airport for a late evening flight (May 14) to Las Vegas. 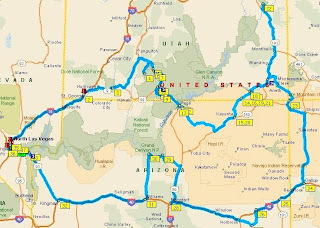 Here is the route we will be driving in a somewhat clockwise path and photographing Zion National Park, Bryce Canyon National Park, Grand Staircase, Old Paria Town, Paria Canyon Wilderness, Lake Powell, Horseshoe Bend, Lower Antelope Canyon, Monument Valley, Mexican Hat, Goosenecks State Park, Arches National Park, Four Corners, Gallup, New Mexico, Painted Desert, Old Route 66, Petrified Forest, Flagstaff, Grand Canyon, Hoover Dam, and more Las Vegas Lights. 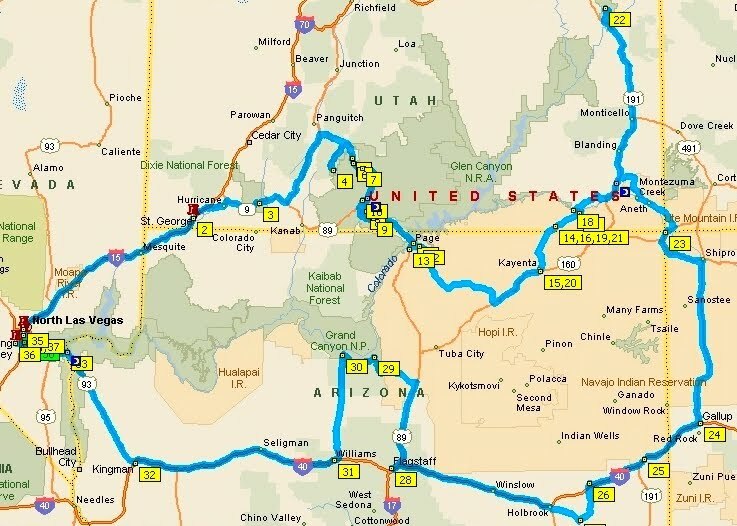 We will cover more than 1800 miles in a week and we are going to try to drive 50 miles straight through the dirt road desert to keep the mileage under 2100. How's about that? My last trip needed two rental cars ... this one might take three. As I mentioned before, our trip will include a photography guide and will allow us to have a full moon to photograph over Monument Valley. We hope you will join us for the ride on this complete photography trip. Kyle has always shown interest in photography and has even taken some pretty whack photos over the years. The photo at the top of the main page on NikonSniper is actually Kyle taking a picture into a mirror. I flipped the photo so you could read Nikon on the camera and altered his eye to give it a bit of a cyborg feel. I will start posting photos from this trip on Sunday evening as we will be running and gunning until we can find an Internet connection to upload. I will try to post a graduation shot or two from O'Hare Airport late on Saturday before we fly.